Precious Metal Calculator is a brand new program that is used in the gold/silver industry. 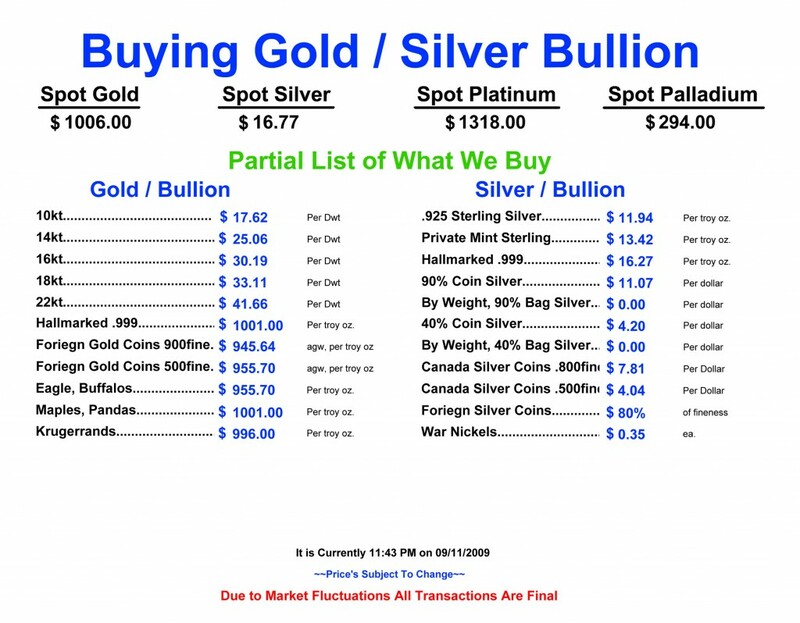 This software was created for the ease of following the gold/silver market displaying an accurate up-to-the-minute price for the spot as well as your buy and or sell prices for each item. You can have 11 lines per side and also have an additional 4 lines on the bottom of the page which can be weighed against any of the four metals. You can also change any text on the page to customize the look and feel of the application to suit your needs. The program includes a ticker at the bottom of the page which can be customized with any number of lines. The lines will continue to cycle as long as the program is running. Also included are features to print, and the ability to export your data so you can save as many profiles as you need. You can download the demo which will fully function for 15 days before you purchase to see how the program can benefit you. There is no monthly fee for the spot prices either, once you purchase the program you will be able to keep and use all the included features. We also have a portable version of this software which runs off of a portable drive for those dealers that travel. Precious Metal Calculator is compatible through windows 7. Our spot prices are created from data gathered from various sources in the precious metal market, we are working to have the most accurate up-to-date prices so you can get the the most beneficial sales possible. We do not have spot feeds for your websites or desktops at this time but we hope to have these services available in the future. Be sure to check back , we are working on other useful applications to help you get the most out of your precious metal.